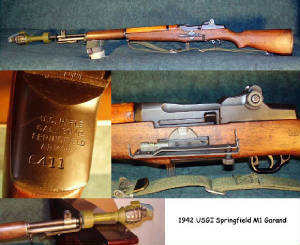 This is the pride of my collection - The USGI Springfield M1 Garand made in June of 1942. I got this from the Civilian Marksmanship Program which gets only authentic Garands. This one had two holes on the side just below the action. A little research showed them to be from a grenade sight. I decide to try and restore it back to its grenade throwing glory. I found a launcher, adapter, and a dummy pineapple grenade and now she sits on my shelf reminding me daily how the freedoms I enjoy were earned.